So there it is, then; The Cavern. 10 Matthew Street, Liverpool 2. Where Brian Epstein first heard and saw The Beatles perform their lunchtime session on Thursday 9th November 1961. You know it’s not exactly the same Cavern that the Beatles used to play in, but even so…and, anyway, it’s the closest thing you’re ever gonna get. It’s cleaner than expected from the descriptions in countless magazines and books – though is that the smell of stale beer drifting up the stairs, subtly mixed with cigarette smoke from outside and, wait, just a hint of ripe perspiration? Heck, it’s a club! The Cavern only sold soft drinks in those far off, heady, days; but the pre-owned fag-smoke and sweat would have been there in abundance. Downstairs are what look like the famous brick arches you’ve seen in all the grainy photographs and archive footage. It’s certainly packed with enough people, straining toward the tiny stage at the end of the tunnel, barely big enough for a solo performer, let alone a band of three leaping leather clad lunatics and their drummer. There aren’t too many beehive hair-dos, but the main difference is that it’s in colour. Because, as everyone knows, the Beatles played in black and white. It was a laff; a lorra lorra laffs. 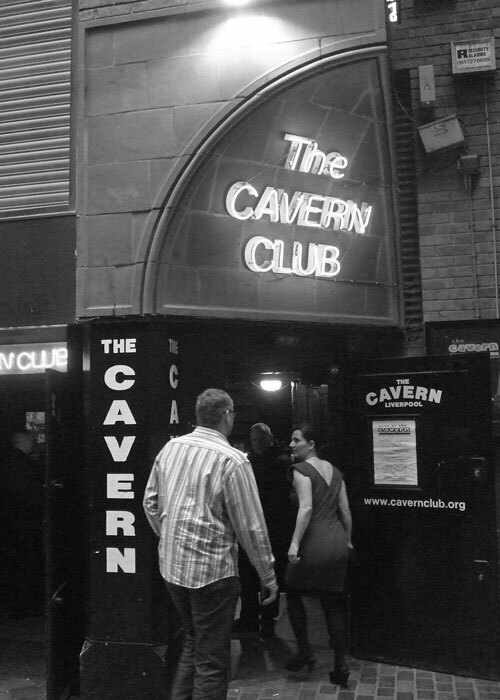 The old Cavern opened its doors as a jazz club on 16th January 1957. Three brick arches under a warehouse in the warren of cobbled lanes leading up from Liverpool’s docks. The owner, Alan Synter, named it after a Paris jazz club, Le Caveau de la Huchette, and booked the greats of British jazz, the likes of George Melly, Humphrey Lyttleton and Acker Bilk, to play there. The odd skiffle band was booked too. Skiffle, it was reasoned, was a child of jazz. The sound was popularised in Britain by Lonnie Donegan, who became known as the King of Skiffle, but almost anyone with a cheap guitar, banjo, T-chest bass and washboard could play it. 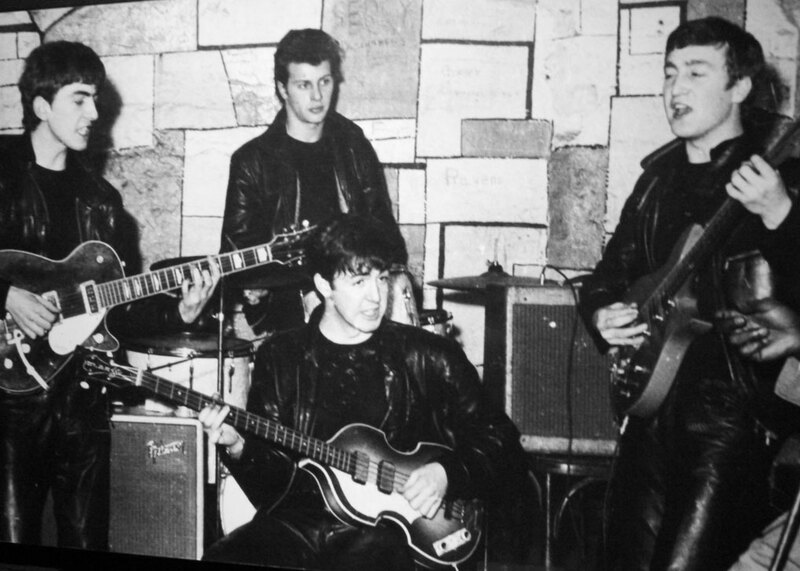 John Lennon’s schoolboy skiffle band, the Quarrymen, got a booking at the Cavern in the August after it opened. Typically, in defiance of the club’s ban on rock music, Lennon started playing a Chuck Berry number (some sources say it was Presley’s Don’t Be Cruel). He was handed a note and said to the audience, “We’ve had a request.” He opened the note, which read: “Cut out the bloody rock ‘n’ roll.” Paul McCartney didn’t play that day; he was away at scout camp. So this was where Brian Epstein, manager of his family’s local record shop in Whitechapel, came after a customer, Raymond Jones, had asked for a recording of My Bonnie by a local group, The Beatles, who Epstein had never heard of. By early December, he was their manager. 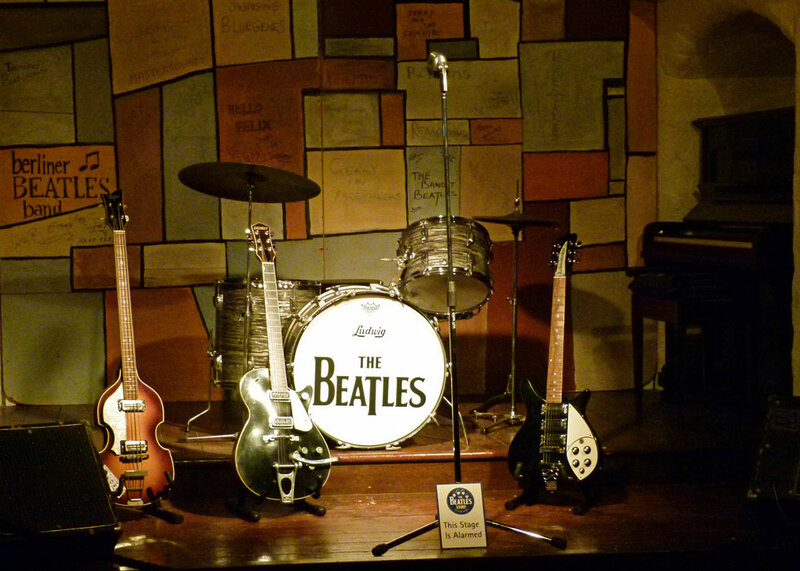 In all, the Beatles made 292 appearances at the Cavern, the last being on 3rd August 1963. By that time, their first LP (album), Please Please Me had been released and the world lay ahead. The club was of course a venue for other local talent too, with bands like the Searchers, Gerry and the Pacemakers and the Big Three attracting huge followings. Then they all came – the Kinks, Stones, Yardbirds, Who – anyone who was anyone in the British pop scene of the 1960s. The original Cavern was entombed in 1973, to make way for a rail development. It’s like pouring concrete into the Houses of Parliament to build a motorway isn’t it? But you know there’s a reasonably happy ending to this. In 1984 a new Cavern rose, phoenix-like from the old, using about 15,000 original bricks, more or less on the same spot. After various vicissitudes, it’s still there, apparently successful, and more or less a required stop on any visit to Liverpool. 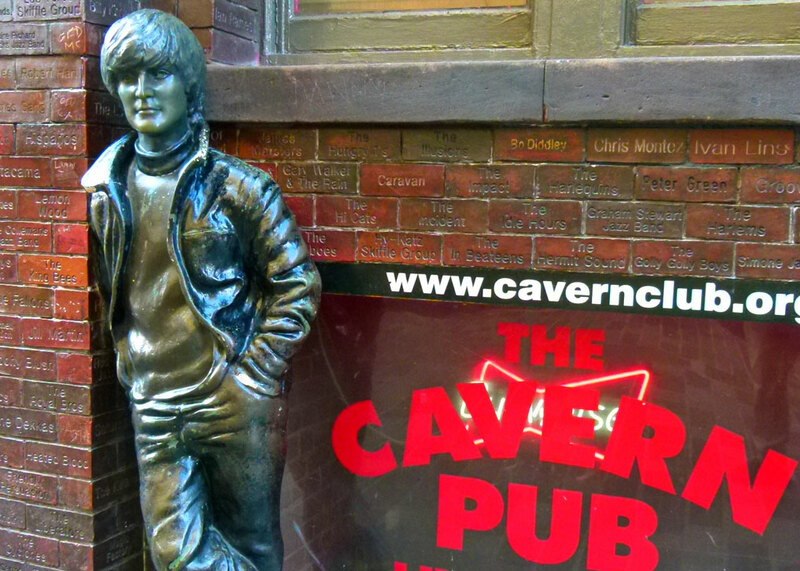 Today’s Cavern Club offers live music every day of the week. These days, in addition to the front stage there’s a second one, the ‘Live Lounge’. And as well as local acts and the inevitable tribute bands, it has played host to the likes of the Arctic Monkeys, Adele, Jessie J – and so on. 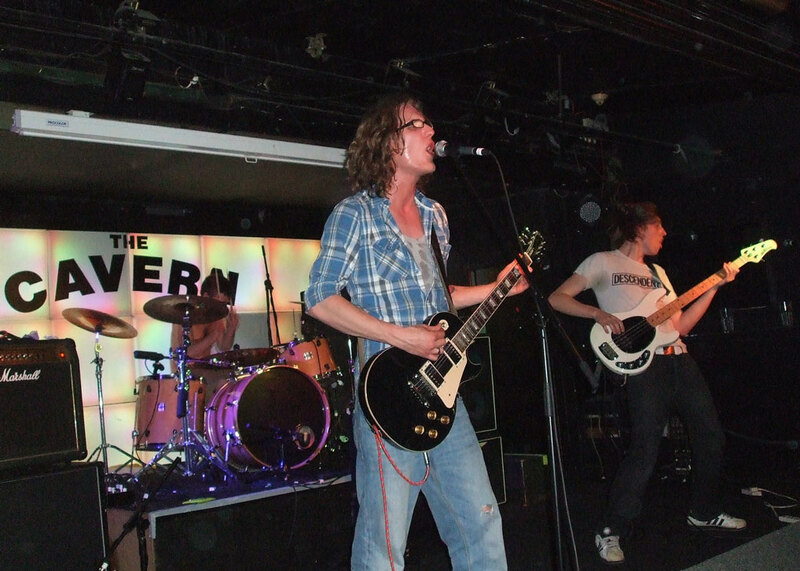 Opposite is the Cavern Pub – another live music venue. 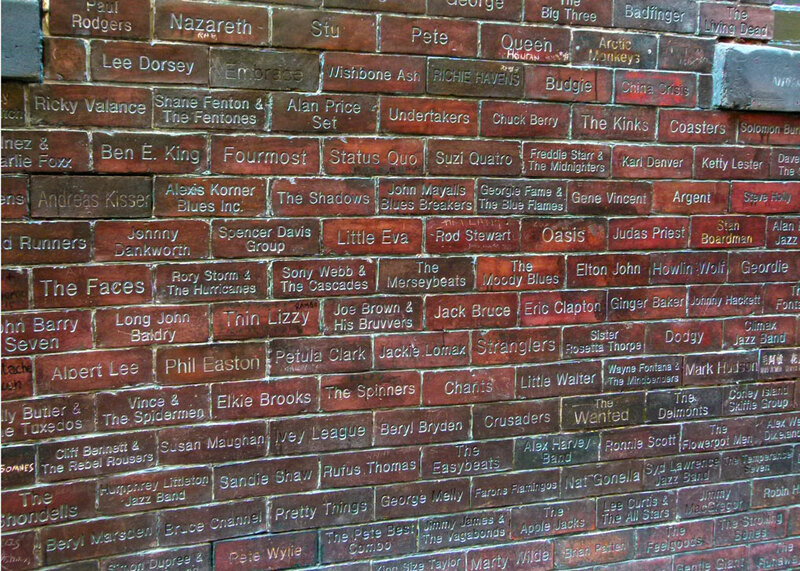 Just outside is the Cavern Wall of Fame, with the names of almost 2,000 acts that have played there etched into the bricks. It also features 54 Liverpool-based musicians who have had UK No 1 chart hits since 1952. 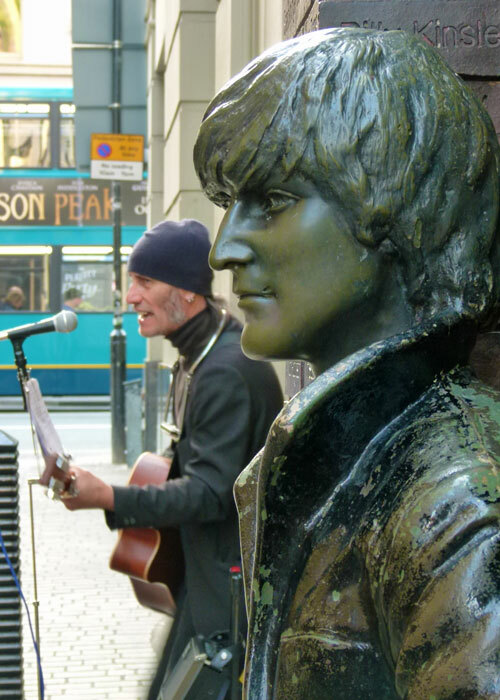 Slouched nearby is a watchful John Lennon statue. 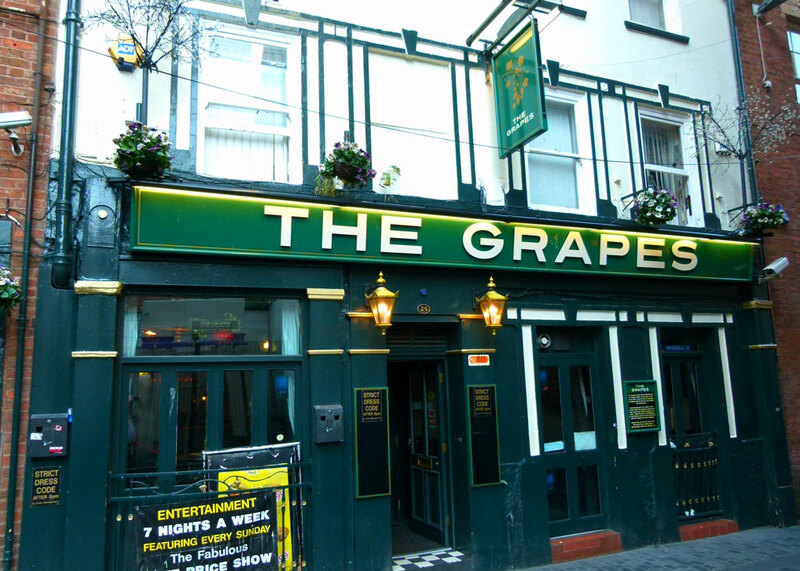 A few steps away is The Grapes pub, where John, Paul, George and Ringo would grab a pint or two between sets. But that’s another story. 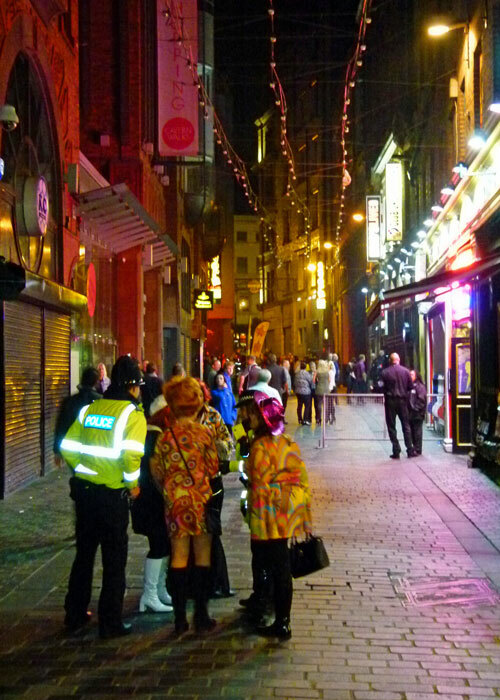 Liverpool has proudly capitalised on its four famous sons and nowhere is this more obvious than the Mathew Street area, which has been branded the Cavern Quarter. Here, you will find, amongst other things, Beatles’ souvenirs aplenty in the Beatles’ Shop, a Rubber Soul Beatles’ Bar, a Lennon’s Bar and Fab 4 Pizzas. It is brash. At night, it can be raucous, a destination for stag and hen parties, the inebriated, the loud, the mildly fractious and, sometimes, the downright violent. Round the corner in North John Street is the Hard Days Night Hotel. In nearby Stanley Street is the statue of Eleanor Rigby. Here is a short video clip, which I made in 2010, allowing you to experience something of the Cavern Club. My apologies for the poor quality – and its brevity. I grew up with Beatles music ringing in my teenage ears but sadly never had the opportunity to see them live. I’d love to go to the Cavern and sing along with the drunken crowd in your short video. Whenever I hear Beatles music on the radio I sing along, loudly, it’s quite worrying that I know all the words!!!! Well that was fun, including the video clip at the end. I almost clicked on the Downton Abbey video offered after, but restrained myself. I’m so glad the world is in color now and that smoking is no longer allowed in pubs. Over here, whenever PBS wants more money, they drag out a Pledge Drive, often Peter Paul and Mary or some Doo Wop group to promote it (incredible, if they actually want people to donate! ), but the only one I ever listen to is ‘The British Invasion,’ which is all the great British bands from the 60s. SO FUN! And they were just kids! I still get that with new artists today occasionally- that indefinable moment when you see someone performing and become a lifelong fan, almost unknowingly hooked in like a fish. I’ve been a Beatles fan since the beginning. But I really want to say that I’m very sorry for what’s happened in your country today. Thanks Lisa. It’s obviously heartbreaking and horrific. But do these evil, twisted, fanatics really think they can beat us? Of course they can’t. One of my favourite places to visit in Liverpool. The atmosphere is terrific and you meet people from all over the world. I got absolutely bladdered in the (replacement) Cavern one night (during my mature student days at the Uni) A conga broke out and someone hauled me off my seat to join in. I was having trouble keeping up and tried to stop to get out of line – but the floor was so wet I couldn’t get a grip and I ended up ‘surfing’ on spilled beer! You wouldn’t have seen a man with his shirt hanging outside his jeans in the Beatles’ day! And none of them are wearing coats – so no job for young Priscilla. In reply to the comment you left on my blog I guess you heard about Admiral Byng because another petition was handed in, on the 260th anniversary of his death which was last week. I wonder if he’ll be pardoned at last? One might excuse a politician for an occasional murder if it were not accompanied by cowardice and lying too. Once again, I learnt tons of info! On a visit to Liverpool in1979 just before I went to Liverpool Poly a friend took us to the railed-off site where the old Cavern had been and we had our photos taken there. It seems strange that the powers that be left it a few years before rebuilding the Cavern. When I was a student in Liverpool nothing was said about it but, I was busy doing other things and it might have passed me by. Love the Beatles for always! Thanks for this post, I doubt I will ever make it that far north. Thanks for the back history. Don’t think I’ll ever make the trip there. You wonder what John would think of the resurrected club.